The Citi® Secured Mastercard® is a no annual fee credit card that helps you build your credit when used responsibly. Unlike a debit card, it helps build your credit history with monthly reporting to all 3 major credit bureaus. Once available, you will also have free access to your FICO score online. Use your card anywhere Mastercard® is accepted — worldwide. A security deposit is required. Once approved, your credit limit will be equal to your security deposit (minimum of $200). Get help staying on track with Auto Pay and account alerts. With Flexible Payment Due Dates, you can choose any available due date in the beginning, middle or end of the month. Manage your account 24/7 online, by phone, or in our mobile app. 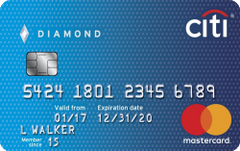 Our take: A good starter card for those who are new to credit, the Citi Secured Mastercard allows cardholders to jumpstart their credit history without committing to a high annual fee.